Where else could you get a “Tiki Tissue Box” that releases the stored tissues through it’s nose? Or an assortment of candies like “Ear Wax Candy” (don’t ask) - or “Toothache Candy” - or even “Log Cabin Candy” that you can build a ‘log cabin’ with and then eat it? How about “Edible Dentures” - or for the intellectuals in your orbit - “Nihilist Chewing Gum?” I say intellectuals because it would take one to know what a nihilist is, let alone spell it. I have to admit, some of the products on this site are ... shall we say ... just gross - Gross enough that I don’t even want to mention them. Some of these cool new gadgets have been mentioned on TV though - Good Morning America, for example. 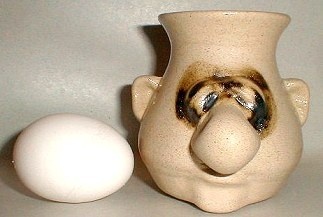 Like the world’s grossest cooking tool - a ceramic mug designed like a head with a big nose. You crack an egg into the head and tilt it forward - and the white separates from the yoke - and pours out through the nose! Extremely gross for the pure of heart - but it’s funny and it really works! Another cool one seen on GMA (since we’re in the kitchen) is the “Once Bitten Cookie Cutter.” Use this tool and all of the cookies you bake will look like someone beat you to the first bite and put the cookie back. Picture mugs that change when you add hot liquid to the mug - like “Henry VIII’s Disappearing Wives” and the “Global Warming Disappearing Land” mugs. How about a doormat that instead of reading ‘welcome,’ reads “Nice Underwear?” I mean, what could be cooler than that? Or the practical cool new gadget that is just in time for the flu season. It is a soap dispenser shaped like a toilet bowl. you set it next to “the facility.” When someone uses the “facility,” and starts to move away, the bowls lid starts flapping and a voice says “Hey, don’t forget to wash your hands.” It’s hard to ignore a toilet giving advice. All these cool new gadgets and more are on this site. the whole site is presented with a tongue in cheek - and with some very refreshing - and funny writing. A truly pleasurable venture for those who look for the offbeat, funny, weird, wacko, and truly gross in cool new gadgets - and enjoy good humor in their presentation. look no more.